Actually, I had a doubt to write about Sudirman Street. There was a feeling about why it should be written. It was just a street and Google Maps can provide anyone with a direction how to reach it. The article may not attract many readers to come. However against that feeling, finally it is decided to write a post about the street. It may be followed by many other posts related to the streets in Bogor. It may not be attractive but somehow I believe , someone, someday may need this type of information for their trip to my city. The current name of the street is taken from the name of a hero in Indonesia i.e. General Sudirman. The guy led Indonesian freedom fighter to combat a better equipped Dutch Army during Indonesian War between 1945-1949. Nevertheless, Sudirman was attached to the city long time after the street was born. We must go back quite a lot to Nineteen Century i.e. in the year of 1808 to know the inborn name. Yes, the street was developed in the year or more than 200 years ago. Herman Willem Daendels was the creator. In order to provide all of Dutch colony in Java (Dutch East Indie), he decided to establish a road between Anyer (West Java) to Panarukan (East Java). The road stretched from one end of Java Island to the other. The length reached more than a thousand kilometers. It was developed within only one year. The cost of the road development were quite heavy. More than 12,000 lives were spent from the start to its completion date. The title ordained to this road was De Grote Post Weg or The Great Post Road. This name referred to the fact that every 4.5 Km, there was a post or shelter used to receive postal items such as mail and also logistics. The Great Post Road were a very long road. 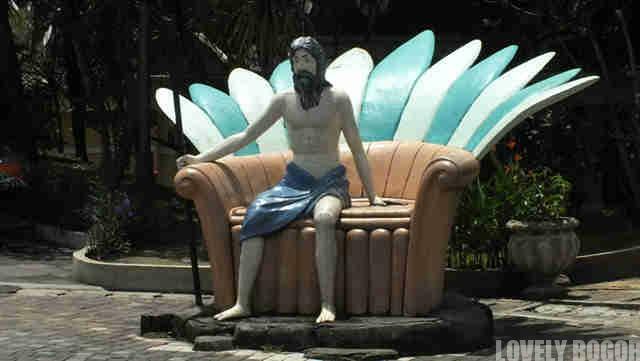 It was set up through many cities in Java and one of the cities was Bogor. 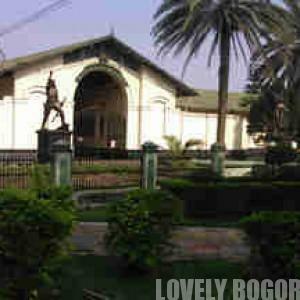 It was not yet known as Bogor at that time, the name was still Buitenzorg or the Place of no worry. 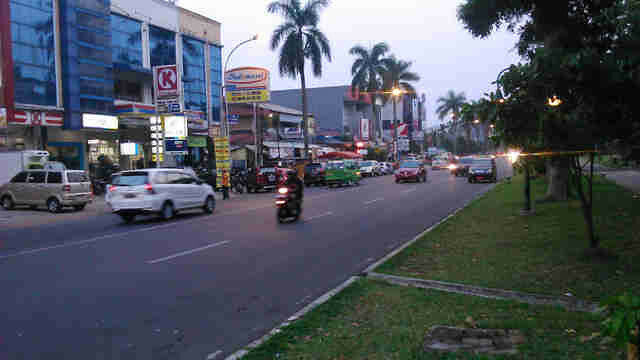 The parts of The Great Road in Bogor now have become 4-5 streets and Sudirman Street is one of them. Its original name was only changed to its nowadays name in early 1970. Sudirman Street is not a long street. It is only 1,350 M.
It is a two ways street with each lane width around 5-6 meters. In the past on each side of the street, Canarium trees lined forming a big canopy for the street. Unfortunately due to their ages, the trees became fragile and finally many of them were cut and have been replaced by palm trees. 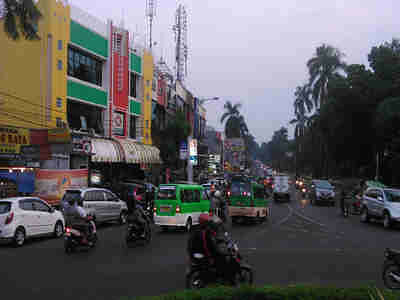 The street is one main access to the center of Bogor City. It is connected with many other streets on each end and also on the middle. Buildings on the street are a combination of modern and old style. of course the modern ones occupy more. The oldest building on this oldest street is utilized now as a PETA Museum (The Freedom Fighter Museum).The structure was said to be built in 1745. Another one is the facility of Indonesian Army’s Engineers Corps near the Fountain Park.. There are two iconic buildings can be seen from this street. 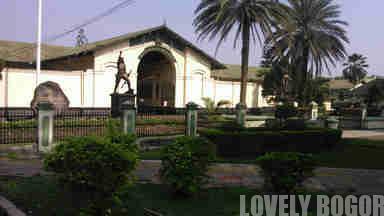 The first one is the Bogor Palace and the other one is the Fountain Park. It can be said that Sudirman Street connect these two places like a straight line. Other buildings are mostly business purposed. There is no residential houses on the street. Sudirman Street is a busy street. Its activities start at very early in the morning and will only be quiet near to dawn breaking. Even in weekend or holidays, the street lives almost 24 hours. The reason for this is because the street is full with culinary tourism , especially on the night. Streets vendors open their tents in the afternoon time offering many traditional types of food and culinary. How to reach Sudirman Street? It depends. There are two many entry points. Sudirman Street can be accessed from all directions. 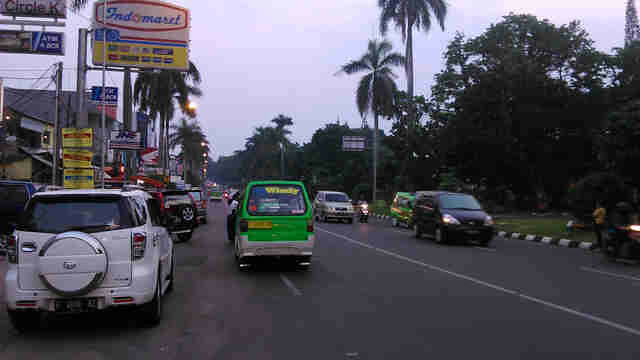 If you can see the Bogor Palace then you are near this street. You can take angkot, Bogor’s public transportation to get here. The trajectory that you should take is the red 07. Some others can also be used such as Blue 07 and 08 , or Red 12 but they will turn to another street at the middle. I would suggest if you are not in hurry to take a walk than using angkot. The pavement is wide and the trees canopy protects you from the sunshine, especially in the afternoon. You can also enjoy some street food here. One of them is called Martabak Air Mancur whose store is located on the opposite direction of the Bogor Palace. It is sweet and nice.